Are French people really drinking red wine all day while smoking cigarettes and cursing Americans? Not so sure! In her new piece, Coucou student Lydia digs into five of the biggest French stereotypes. I came upon a cartoon recently that was so obviously a depiction of a Frenchman it almost hurt. What gave it away? 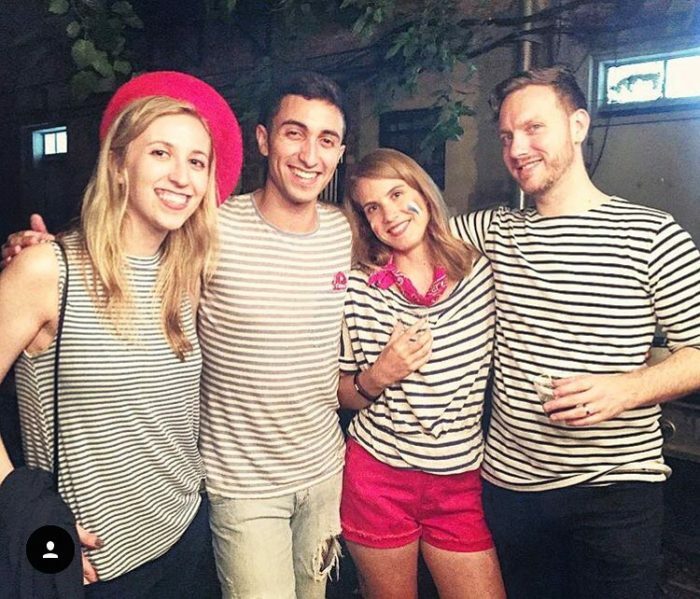 The beret, the striped ‘Breton’ shirt, or the baguette? Or was it the obligatory cigarette dangling like a vital appendage from the cartoon’s lip? Or the mustache, likely added for good measure? I mean, if a picture is worth a thousand words then this one has 999 to spare because there was only one word dominating my thoughts: French. After a quick personal chuckle, I thought about my years in France and began counting the times I actually saw someone French wearing a beret, which didn’t take long because I could think of only two, and I’m not even sure they were French. This made me wonder about stereotypes, particularly those regarding the French, and where they come from, because I did not know. As it turns out, there is actually a reason we foreigners depict the French in this way and it started in the 1950s when Frenchmen, known as ‘Onion Johnnies,’ in berets and striped shirts, rode their onion decked bikes through Britain to sell their produce on a small scale. The British who bought from these Onion Johnnies weren’t exactly globetrotters, making these beret wearing, onion carrying guys the only depiction they ever had of the French and voilà, the stereotype was born. This brought to mind other French stereotypes and where they fall in reality based on my experiences in the country. Smoking cigarettes, hating Americans, only speaking French, eating frogs and snails, and waiters being rude are the stereotypes that quickly came to mind. Almost everyone thinks of the French as a group of smokers, why else would the cartoonist add that little guy in? I can’t really deny this one either, at some parties I went to in Paris they’d smoke so much I’d actually turn into a cigarette. My hair and body would pick up so much of the scent that it would stay with me throughout my journey home and contaminate my room and sheets, which would then smell until the air from the open windows could waft it away. I had a friend who would bike up a 50 degree incline with a cigarette in his mouth and keep it there even after breaking into a session of raging coughs. So the French smoke, yes, BUT not all of them do. The whole anti-smoking thing the US started is going on in Paris too, even if it’s going at a slower pace, a lot of them have already gotten there. The French, along with a lot of other people as it turns out, have a general distaste for Americans. This one is both true and false. A lot of the French judge Americans based on the stereotypes that they associate with them like being loud, fake, and materialistic. However, many of them are dying to travel to the US or regale you with tales of their visits, and are perfectly happy, and excited even, to meet and talk with an American. Apparently, Americans can be as charming to the French as the French are to Americans. III. They Speak French. Period. If the French refuse to speak any language besides French then why is it that when I was there I was in a constant battle with them over which language to speak, French or English? I wanted to speak French with them and they wanted to speak English with me. Sure, there are a lot of people who don’t speak anything but French, but those are mostly from the older generation of parents and grandparents who were born at a time when French was a more dominant language. These days, most younger Frenchies speak at least some basic English, and many speak at a high level. The French are so associated with the word “frog” that they actually have the slightly offensive nickname, frogs, thanks to the British. Even if the French were endlessly eating frogs when the British coined this term, they certainly aren’t now. Frog’s legs are difficult to find on a menu these days. The only restaurant where I was able to find fresh ones (because as it is, if you want them you have to settle for frozen) was in a 3 star Michelin restaurant in Burgundy, and that was only because they “knew a guy.” It’s hard to consider something you can only find in the freezer aisle a staple. Snails, on the other hand, are a lot easier to find than frog’s legs, but that doesn’t mean the French eat them at the degree to which they are accused. The only time I’ve ever seen an actual French person eat a snail was during a trip to the countryside when someone brought two pounds of them back from the market and out of a group of 20, only about 5 of us touched them. In the end, I ate more of them than anyone (but only because they kept being dumped on my plate). This stereotype is a personal favorite on so many levels. For one thing, even the French think the waitstaff is rude, which I find both charming and hilarious. Going into a French restaurant inevitably means feeling like an imposition from time to time, waiting 20 minutes for the waiter when you only asked for one minute to look over your menu, and as for getting that water you asked for, well, that’s anyone’s bet. But… some waiters are actually nice! I’ve met tourists who leave France surprised that they didn’t encounter a single bad waiter and I myself have become friendly with a few of them. On a side note, I actually prefer going to cafés in Paris to going to cafés in New York because it feels so much more leisurely. So, while we sit around picturing the French frolicking by the Eiffel Tower (a place they avoid) wearing haute couture (something they can’t afford), and being romantic (they try), they are actually just out there doing completely normal things, like everybody else. Sure, some French can be quite, well, French, but as a general rule, many of the stereotypes simply no longer apply.